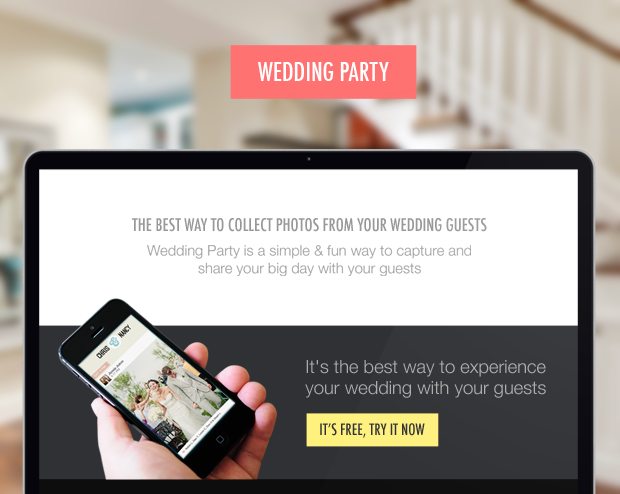 Wedding Party, the mobile app that allows wedding guests, friends and family to contribute to a shared, digital album of photos and notes which can later be posted directly to the couple’s Facebook timeline, has raised $1 million in seed funding in a round jointly led by NEA and Felicis Ventures. Also participating were a number of angel investors, including early Dropbox investor Pejman Nozad, plus Ullas Naik, Darian Shirazi, Rich Chen, Zeki and Haroon Mokhtarzada, Doug Pepper, Mark Jung, Kumar Malavalli, Chris Hobbs, Hamid Barkhordar, Sam Ferdows, and Merced Partners. The app, which first launched this summer on iPhone only, was being bootstrapped by Ajay Kamat, Himani Amoli, Gordon McCreight and Dan Perez, three of whom had previous social community building experience from an earlier project called MicroMobs. Dan, meanwhile, came from Coupons.com. Since its original debut, Wedding Party has expanded to Android, where it’s now available in beta. The Android version isn’t yet feature-complete compared with the iPhone app, says co-founder Ajay Kamat, so that will be an immediate focus for the company’s product development efforts. Longer-term, the team is thinking about ways to bring the experience of viewing the collected and photos to the iPad’s bigger screen. Currently, wedding guests and newlyweds can revisit their digital album after the fact either via Facebook (if they choose to publish there) or through an album on the Wedding Party website itself. In addition, thanks to a partnership with MyWedding.com, the album can also be integrated into the couple’s main wedding website. When the team first created the app, they thought of it as something the couple would ask their guests to use on their big day, but they soon found that their users had other ideas. “The biggest surprise for us was that, almost immediately, we saw that people were using us months and months in advance of their wedding,” says Kamat. “They were using it to get their friends and family involved in the wedding experience early on. We’re seeing things like cake tastings, dress fittings, rehearsal dinners,” he adds. To support this slight shift in focus, Wedding Party has been updated with features designed for all the expanded use cases. It now offers things like upgraded guest pages with collages of all the photos the guests were involved in, plus is has added the ability for users to tag people in photos. “Going forward, we’re going to be building more features that focus not only on the photos of the wedding itself, but the people who were involved in the wedding,” Kamat notes. With the additional funding, the Palo Alto-based team, which has already grown from four to six will hire a couple more developers and designers to help them grow. They’re also actively working on adding more functionality, including the soon-to-arrive ability to upload photos from the web (desktop or mobile). Though seemingly minor, that feature could actually help Wedding Party grow from what may still be thought of, in some cases, as a supplemental album, to one of a more professional nature, as the couple or their photographer could now upload the high-quality photos from the big day alongside those gathered by friends and family. Wedding Party is one of many new startups focused on the weddings space, including (but definitely not limited to) RegistryLove, Appy Couple, Wedit, Lover.ly, WedPics, WeddingLovely, Weduary, HoneyBook, Carats & Cake, and more. But while many of these companies are targeted towards the couple, or more honestly, the bride, Wedding Party is one of the few which is thinking about improving the guests’ experiences and involvement with the wedding, which in turn, ends up benefitting the bride(s) and/or groom(s). For the newly engaged, or anyone else involved in the wedding planning (or those who want to remarry now that there are all these great services! ), Wedding Party is a free download from here.